With the weather getting hotter each day, I think its a pretty tall order trying to stay fair. Perhaps not, with Orbis's = U WHITE brightening range: boasting a protective armour called W.H. Amino Shield to hinder melanin production (the cause of spots) and fortifies the skin against damaging UV rays and dryness. Plus, rest assured that despite these powerful claims, chances of breakouts are slim....because the formulation is 100% oil free! 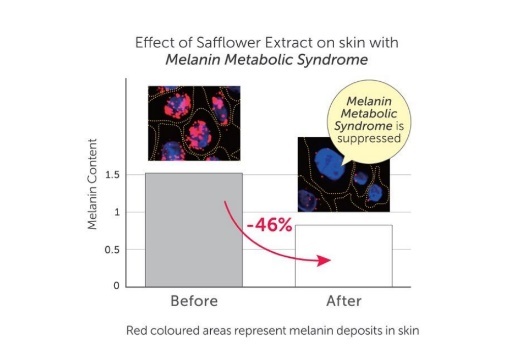 According to research studies, it has been shown that the larger the amount of activated Histidase (the enzyme for clarity) in the skin, the lower its melanin index. Hence to create such an environment of being rich in moisture and free of oil, ORBIS introduces its 100% oil-free formula to allow skin to fully reach its potential for clarity, texture, smoothness, firmness, protection and hydration. The Orbis =U white Jelly Wash ($33) has a unique clear jelly-like texture that actually feels really nice on skin when you put in the fridge prior to using. It helps to trap unnecessary keratin (the thing that milia seeds are made of), sebum and impurities for an all round gentle but thorough clean. However, it does not really lather that much, so there is a tendency to squeeze a larger amount than my usual 20c dollop to wash. I like that it leaves skin feeling clean without that taut, drying after effect. It also feels especially gentle to use for my red and inflamed skin that is post-facial treatment. This would be better suited for a drier skin type, as opposed to a oily skin type such as mine. 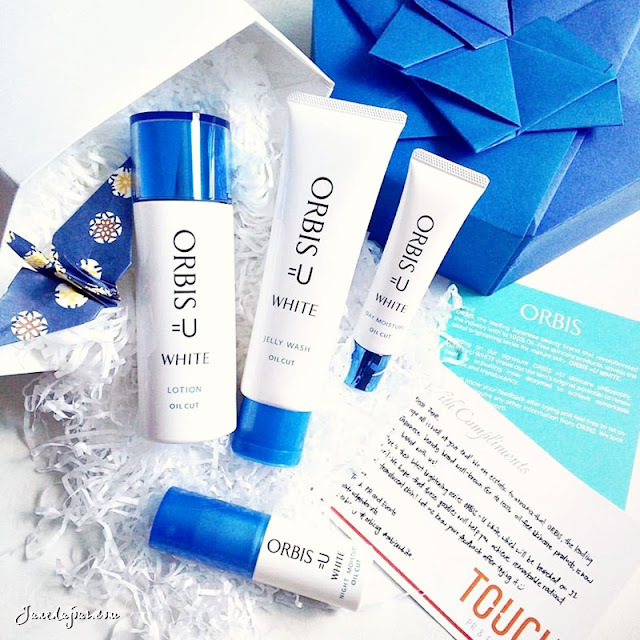 The Orbis =U White Day Moisturiser ($52) is a milky white cream with a gelish consistency. It contains SPF 30 PA ++ and Moist Lasting Veil Technology, so you can really just skip adding on that additional step of sunscreen but still retain a healthy amount of facial moisturization. It has a bit of a 'draggy' feel when trying to blend into skin, but if you already have a serum on prior it soothes out much better, to leave a silky layer on the skin. While it does not leave any visible white cast, as you can see there is still just a very light layer of translucent whiteness due to its sun protection ingredient. Hence, I found this pretty awesome as a primer before makeup to even out skin texture and brighten the complexion. Separately for days without makeup, I simply slather this on for both moisturization and sun protection. I found the Orbis =U White Lotion ($52), which is essentially a toner, good for calming the redness areas of my face as I gently pat it on. Should you have enlarged pores like me, you can try to apply this before layering the Day Moisturise for a better texture (do make sure lotion fully absorbs first); both used together does feel heavy on the skin so that's good. I did notice that it leaves a slightly tacky layer of hydration on skin. Ending the routine is the Orbis =U White Night Moisture ($56), and I'm surprised that for an overnight moisturiser, the product is actually a clear, lightweight watery gel. However upon applying, I realise that its hydrating factor is much more than its appearance shows; it leaves a refreshing layer of moisturization that is fast absorbed into skin. Yet its non-greasy, so I can simply jump into bed without worrying about staining my pillows and such. I found the Orbis =U White range perhaps one of the mildest and forgiving ranges I've tried. Being fragrance, color, alcohol and oil-free, means that there is lesser amounts of chemical additives to irritate the most sensitive of skin. After about 1-2 weeks of usage, my skin looked abit brighter than before, and my enlarged pores looked signficantly less visible than before. Thank you Orbis Sg and Touch PR!